Across the UK, academics, health professionals, voluntary organisations, communities and others are using arts and humanities research and methodology to improve the quality of life and wellbeing of the population. The Health Humanities Medal will celebrate and showcase the work being done in this area by individuals, teams and organisations. Submissions are invited across five categories, which cover a broad scope of research – from collaborations which have impacted the health and wellbeing of a wider community, to research which addresses the needs of a country outside the UK, through to the Leadership Award – which recognises those who have played an instrumental or innovative role in the field of health humanities. Awards in all five categories, including the recipient of the Health Humanities Medal, will be made and announced at a ceremony in London in September 2018. 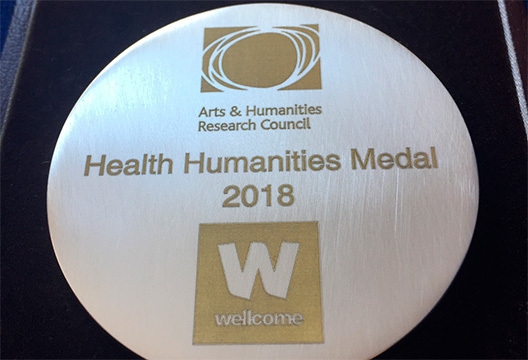 The Awards will offer a great opportunity for researchers, arts practitioners, clinicians and others who have made a difference in the health humanities to step into the limelight and encourage others to become involved. Professor Paul Crawford, from the University of Nottingham, who has led the development of this new award, said: 'The arts and humanities are major forces in keeping people well, connecting them socially and restoring them to good health. The value of the arts and humanities in transforming health and wellbeing is well-known, with substantial research conducted globally, yet there has been little in the way of prominent awards for work in this area. Applications and nominations are now open until the closing date of 4pm on Thursday 24th May.